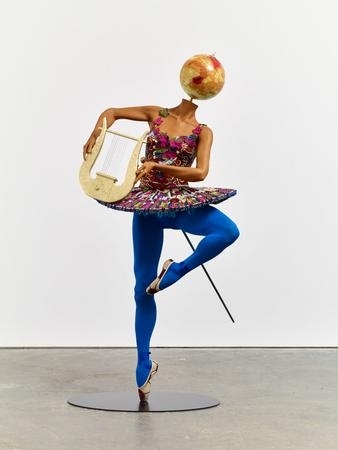 James Cohan Gallery is pleased to announce the upcoming exhibition by Nigerian-British artist Yinka Shonibare MBE entitled Rage of the Ballet Gods, opening on April 30th running through June 20, 2015. In this new body of work, Shonibare contemplates the changing state of the Earth’s climate and the human instinct for survival in the face of the extreme weather experienced worldwide. 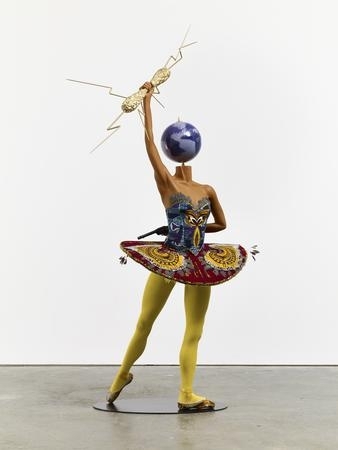 The artist is well known for his employment of historical events as metaphors with which to explore current geo-political and social conditions, and Rage of the Ballet Gods points to the progress of rational thought—a legacy of the Age of Enlightenment—that underlies the scientific advances propelling us towards environmental doom. Inspired to make a poetic statement, Shonibare turns to mythology to uncover this paradox. The exhibition is divided in two parts: Rage and Escape. In Rage, the Greek gods Apollo, Zeus and Poseidon are depicted as ballerinas. These iconically male figures have been transformed into emblems of female grace, with detailed tutus made of Shonibare’s signature Dutch wax fabric. 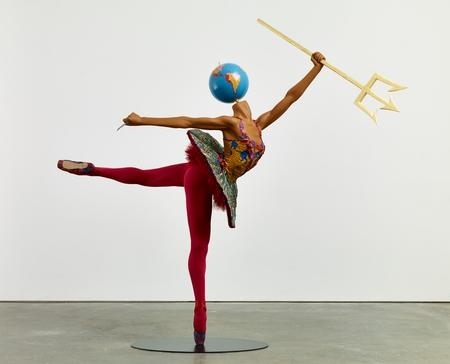 Yet these beautiful ballerina goddesses are dangerous, in a violent rage against humans for their willful and continual destruction of Earth. They carry deadly weapons—a gun, a knife and a sword—along with their familiar trident, thunder bolt and golden lyre. Their heads of Victorian-style globes map the occurrence of lightening, warming and tsunamis around the world. Shonibare faces the subject with characteristic playfulness as he reveals the irony of the situation: throughout mythology, it is the Gods who used weather events such as storms, earthquakes and droughts to punish humans. In Homer’s Odyssey, the jealous Poseidon punishes the hero Odysseus with violent storms that turn his ship around and keep him, time and time again, from returning to his home to Ithaca. Here, however, the Gods are enraged because the humans have usurped their prerogative as creators of terrifying weather events. Shonibare’s gods are upset that traditional order of the world has been turned upside down and that the transcendent truths, on which the history of mankind is based, are disappearing. The four walls of the main gallery—North, South, East and West—features photographic tondos of Medusa based on Caravaggio’s portrait in the Uffizi Gallery, Florence. The four works in the series depict women of different races—European, Asiatic, Indian and African—representing the four corners of the world. 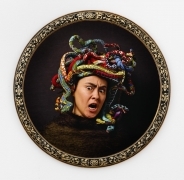 Medusa broke her vow of celibacy and married the god Poseidon, for which, as punishment, the goddess Athena turned her golden locks into a morass of snakes. 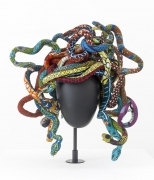 Shonibare’s Medusa has a tangle of snake hair made from African textiles. Escape, the second part of the exhibition, concerns escape from the apocalypse. The works serve as a humorous yet prophetic warning that we may need to seek new ground should the Earth become inhabitable. Shonibare’s Refugee Astronaut is a disheveled space traveler toting his worldly possessions on his back—pots, pans, butterfly net, stool and family photographs—ready to find a new oasis. A pair of Butterfly Kid sculptures depict a boy and girl sprouting wings, metamorphosing to fly away and escape. 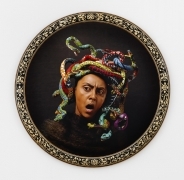 Concurrent with the gallery show, Shonibare is featured in three solo exhibitions: Colonial Arrangements at the historic Morris-Jumel Mansion in Washington Heights, NY (opening May 1, 2015); Pièces de résistance at the DHC/Art foundation in Montreal (opening April 28, 2015); and his first Asian retrospective exhibition at the Daegu Art Museum in Korea (opening June 2015). 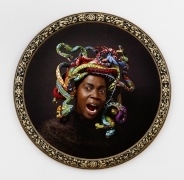 Yinka Shonibare MBE (born 1962 in London, UK) moved to Lagos, Nigeria at the age of three. He returned to London to study Fine Art first at the Byam Shaw College of Art (now Central Saint Martins College of Art and Design) and then at Goldsmiths College, where he received his MFA, graduating as part of the ‘Young British Artists’ generation. He gained notoriety on the international stage via his commission for Okwui Enwezor’s Documenta 10, Gallantry and Criminal Conversation (2002), and was a Turner Prize nominee in 2004. In 2005 he was awarded the decoration of Member of the “Most Excellent Order of the British Empire, a title that he officially added on his professional name. His works were featured in the 52nd Biennale di Venezia (2007) and a major mid-career survey toured from 2008–09 at the Museum of Contemporary Art, Sydney, Australia; the Brooklyn Museum, New York; and the Museum of African Art at the Smithsonian Institution, Washington DC. In 2011, the artist’s sculpture Nelson’s Ship in a Bottle was selected for the prestigious Fourth Plinth commission series in London’s Trafalgar Square. In 2013, a major survey show was mounted at Yorkshire Sculpture Park, Wakefield, UK, and travelled in part to Royal Museums Greenwich/The Queen’s House, London, UK; GL Strand, Copenhagen, Denmark; Gdańska Galeria Miejska, Gdansk, Poland; and Wroclaw Contemporary Museum, Wroclaw, Poland. 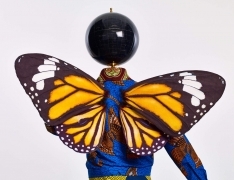 In 2014, Shonibare was the subject of the first contemporary art exhibition at The Barnes Foundation, Philadelphia, PA.
Shonibare’s work is included in many prestigious collections, including Arts Council Collection, UK; Tate, London; Victoria and Albert Museum, London; Museum of Modern Art, NY; The Art Institute of Chicago; MCA, Chicago; The National Gallery of Art, Washington, D.C; National Gallery of Canada, Ottawa; National Gallery of Modern Art, Rome; National Gallery of Victoria, Melbourne, AU; Smithsonian Institutes National Museum of African Art and Hirshhorn Museum & Sculpture Garden; Scottish National Gallery, Edinburgh; The Israel Museum, Jerusalem; Magasin 3 and Modern Museet, Stockholm; Nouveau Musée National de Monaco; Newark Museum, New Jersey; Wroclaw Contemporary Museum, Poland; San Francisco MoMA; MFA Boston; North Carolina Museum of Art, Raleigh; Seattle Art Museum; Walker Arts Center, Minneapolis; Speed Art Museum, Louisville; New Orleans Museum of Art; Toledo Museum of Art, Ohio; RISD Museum, Providence; and Davis Museum, Wellesley College. 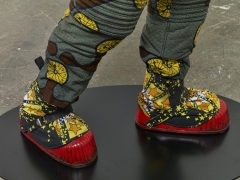 Yinka Shonibare MBE currently lives and works in the East End of London.